On 8 September, the first London Design Biennale officially opened at the historic Somerset House. 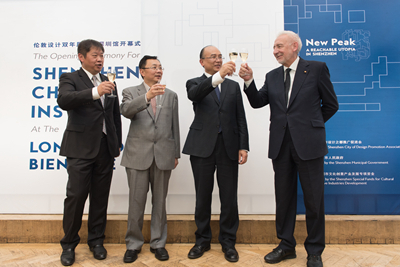 The opening ceremony for Shenzhen China Installation was held on the afternoon of the very same day. 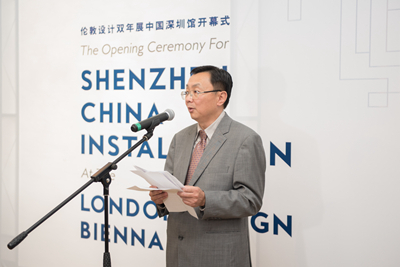 Many of Shenzhen Xu Qin, Charge d'Affaires of the Chinese Embassy in London Ni Jian and Chair of London Design Biennale Sir John Sorrell attended and addressed the event. Nearly one hundred people were present, including famous designers and cultural and business representatives from China and the UK. Charge d'Affaires Ni Jian said in his speech that this event has profound, far-reaching and practical significance. He highlighted "Three News": a new window to showcase Chinese contemporary design works to the world, a new platform for stronger China-UK cultural exchanges and cooperation, a new trend in better life and global growth. He hoped that this event could help both China and the UK generate more ideas, achieve broader consensus and deliver more tangible results in the design industry. The two countries could work together for closer cultural exchanges and cooperation and for a better life of humans, said Mr. Ni. Sir John Sorrell said that the London Design Biennale aimed at providing a global stage for different countries to showcase their design concepts and their interpretations of beautiful life. At present, more and more countries and cities around the world have come to realize that the power of design may lead to social changes and economic growth. The originality in design could bring solutions to lifestyle issues. Mayor Shenzhen Xu Qin thanked the organizing committee for inviting Shenzhen to the event. He said Shenzhen attached great importance to creative design industry and provided favorable policy environment for its development. He praised the Shenzhen China Installation for its innovation, inspiration and quality, and he stressed that Shenzhen was a city always pursuing "innovation, creativity and entrepreneurship". After the opening ceremony, the VIP guests toured the Shenzhen pavilion and viewed exhibition Shenzhen's New Height: Visible Utopia by the famous designer Liu Xiaodu. The concept of this exhibit is to create a gigantic and all-inclusive complex for 50,000 people to live, work and relax. Incorporating various existing technologies, this design aims at offering rational solution to problems that super large-scale, densely-populated cities are facing in the rapid development, such as energy, environment, time and space costs, etc. It seeks to reconstruct an urban management and operation pattern and to redefine people's life and work style. The 2016 London Design Biennale was held at the hostoric Somerset House in London from 7th-27th September. The exhibition aims at encouraging all countries to interpret their history and culture through one piece of design work, facilitating academic exchanges, and paving the way for long-term development of the design industry. The theme of the Biennale is "the utopia of design" in commemoration of the 500th anniversary of the book Utopia by Sir Thomas More. Nearly 40 countries including the UK, the US, France, Germany, Italy, Japan, the Republic of Korea, India and Pakistan participated in the event.